Nerd Glasses that won't obstruct your Dreamworks Face. In many cartoons, characters that wear glasses seem to have their whole eyes fused into the lens. Their eyelids are nowhere to be seen, often all that is seen are pupils and the lens. Often the pupils go squinty when the character blinks, and the frames of the glasses have the ability to move around similar to an Expressive Mask. Presumably, this is simply because drawing eyelids inside the glass frames is rather difficult and would create a less appealing character design. Disney's Atlantis: The Lost Empire averts this with Milo (though briefly played straight during the viewing of an old film reel depicting his childhood), but uses it as a brief visual gag about halfway through the film where Kida actually takes off his glasses because of her curiosity and puts them on her face. Hotel Transylvania has the Expressive Mask variant with the Invisible Man — which, naturally, is the only way for the audience to see his expression. In the My Little Pony: Equestria Girls movie series, the techies wearing Nerd Glasses, notably Scribble Dee and Micro Chips, lean into this, although the glasses don't change shape when they blink (instead the eyelids become visible). Of note, it is entirely averted with the human version of Twilight Sparkle. In the 2005 film of The Hitchhiker's Guide to the Galaxy, Hummakavula wears glasses that apparently magnify his eyes many times. Then he takes them off to reveal that the magnified eyes are in the glasses themselves, and his own eye sockets are sunken, empty pits. This is the first sign to the protagonists that he is more sinister than he appears. The same with Boris the Animal (JUST BORIS!!) in Men in Black 3; his "eyeglasses" sink right into his skull. Scooter's ◊ pupils are attached to the glasses instead of his head. Not to mention Bunsen Honeydew, whose only indication that he can see is his glasses. Mahna Mahna (from the song of the same name) has no visible eyes, and sunglasses that can blink. Sesame Street has Herbert Birdsfoot and Don Music . Iggy Koopa from the Super Mario Bros. series, starting with Super Mario Bros. 3. Bottles from Banjo-Kazooie has eye glasses that even blink. It is possible to see around his glasses. He does have eyes, however, they don't blink. Bentley the Turtle from the Sly Cooper series doesn't even have pupils on his in-game model, let alone eyeballs. Just incredibly thick glasses that grow and shrink to whatever emotion he's feeling. John Egbert. His glasses go so far as to not even be connected to anything; they don't even have a bridge between the lenses. Bro's Triangle Shades act like this as well, despite not having visible pupils. Jade kind of averts it, however, because her eyelashes are visible through the glasses. The same later applies to Jane. Lampshaded in the 2012-02-16 animation , where Brobot slaps Jake's glasses off. His pupils go with them. Jake later manages to cry through his glasses. Several characters in Everyday Heroes have this, most notably Carrie. One good example is seen here. Donald Donlan in Gunnerkrigg Court has some quite expressive eyeglasses . A nice counterpart to his Eyes Always Shut wife . Both Matchu and his love interest Amber. Matchu's in particular can go from rectangular to round depending on his mood. Phil from My Roommate Is an Elf. It's revealed that his eyes are scar tissue after being attacked by a Giant Spider. Ronnie from Whomp! has these. A guest strip revealed that he actually had Black Bead Eyes, and painted the skin around them in white, while an "official" strip showed that his eyes were actually stuck to the lenses. Questionable Content varies considerably. Faye is usually drawn with natural eyes behind realistic frames, but the newest character Tilly/Taffy is much more cartoony in style. Played with on Family Guy where most characters' glasses just happen to be the same size and shape of their eyeballs, though Peter's glasses do change shape when he frowns. Also lampshaded: In "The King Is Dead," Peter takes off his glasses and his pupils stay attached to the lenses. This was mentioned in the DVD commentary for Quagmire's Dad as being the reason it was hard to animate a scene where Peter adjusts his glasses, as, for the most part, they're shown as his eyes. This was averted in the episode Peter-assment, where Peter's glasses were broken and he had to wear contacts. Meg's large glasses are noticeably bigger than her eyes though and, thus, avert this trope. Duckman. His glasses are his eyes: They have eyebrows. ◊ Very odd when he lampshades it by taking the glasses off to clean them: his face is blank. It's also explicitly pointed out in one episode that he has no ears on which to hang the glasses. Coop the Chicken from Yin Yang Yo!. There's an episode of Phineas and Ferb in which Candace puts on glasses to show how serious and focused she is. And her upper and lower lids show up when she blinks and changes expressions. Husband: Why are you always shaking your eyes? Wife: I... I don't shake them like I used to. Husband: Yes you do! You shake 'em here and shake 'em there! Why dontcha go join some stupid shake 'n' rock 'n' roll band? Nora Wakeman from My Life as a Teenage Robot has the "pupils that blink" variation, but her eyelids also show through her lenses. Steve from American Dad! , however, these were most prominent in the earlier episodes, they're harder to notice in the later ones. Dib from Invader Zim. The lenses even disappear as he closes his eyes. His glasses also have wire-thin frames and no earpieces. 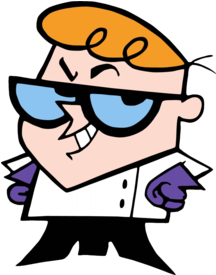 Some fans didn't even realize he wore glasses until Zim mentioned it, at which point we suddenly realized what that narrow line connecting Dib's eyes was supposed to be. Pa Grape from VeggieTales. Despite wearing glasses, he actually doesn't have eyes. Carl from The Adventures of Jimmy Neutron is an odd case, because the 3-D animation makes it possible to see around his glasses and he still has pupils without eyes. Principal Brown from The Amazing World of Gumball. Lampshaded once when he took off his glasses briefly and beneath them was another pair of glasses. Played with in the Total Drama franchise. Of the franchise's bespectacled characters, Beth, Harold, Sam, Mary, Miles, and Tom play it straight while Cameron, Scarlett, and Ellody avert it. Grunkle Stan from Gravity Falls is an interesting case. His eyes are drawn inside the frame; however, they are 'magnified', giving the appearance that his skin appears to be 'fused' to the lens. His glasses also change shape to match his expression, though it's hard to notice, because his eyebrows can be seen over his glasses. Surprisingly averted with Velma in most incarnations of Scooby-Doo. Hanna-Barbara is not normally noted for their painstakingly detailed animation work, but Velma has functioning eyes, eyelids, and eyebrows despite having glasses. It helps a little that her glasses are quite large, so the animators can just draw the whole shebang right onto the lens (nearly everyone else in the series has Skintone Sclerae, so this just makes her look "normal"). Tina from Bob's Burgers plays with this as her eyes are animated/drawn within her glasses. Frizz from The Dreamstone, at least in the first season (the glasses were fazed out in Season 2). Like the Duckman example above, he removes his glasses once (in "The Shrinking Stone") to clean them, and his face is blank except for his nose and mouth. Otto Rocket and Sam Dullard in Rocket Power both wear eye glasses, though Otto himself is far from a nerd. Like his adult counterpart, Scooter on Muppet Babies has these as well as his twin sister, Skeeter. Things get strange in one episode as the kids learn to be more like Gonzo and embrace something weird about themselves. Skeeter takes off her glasses, and shows that her pupils are still in the lenses. And then she shakes her glasses, and the pupils rattle around like Cookie Monster's eyes.